Our Birchbox FINALLY arrived!!! So excited! I am really loving this month's box. I like the variety, and some of the samples were pretty small, but the value is definitely there. LOVE LOVE LOVE this head band!!! Very small-- maybe enough to go on my arms?? I got the Monarch Butterfly scent, which is actually really lovely. Such a nice size, and perfect for travel! SUPER small sample. You are supposed to use a pea size on the areas you want to diminish, so it MAYBE has 3-4 uses in it. The product itself is EXPENSIVE (almost $80!!! ), so I look forward to trying it out! Besame Lipstick, SAMPLER Value???? This is a TINY sampler of the lipstick, but honestly I am LOVING it. It comes in a super cute package that makes it look like a matchbook, and there are three of 2 different colors. I am throwing it in my purse for lipstick emergencies! Total value: $14.81 and that is JUST the box. Remember, Birchbox gives you points for every product you review!! I get an amazing full sized product about once every 3-4 months (you get 50-60 points each month) because I save up until I have $35 worth to add on their mystery bag as well! 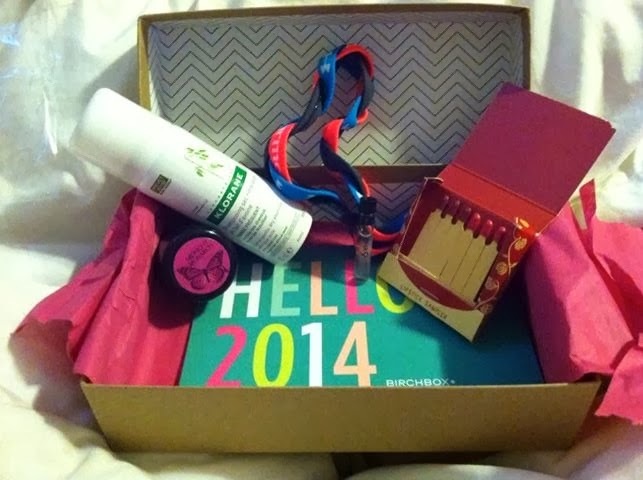 An amazing value in this month's Birchbox, and products I am actually looking forward to! The links above are affiliate links but will not impact your shopping experience with Birchbox. We thank you for supporting MamaBreak! The lipstick samplers are $6. I've purchased them from Besame in the past. They're a good way to try 2 shades before purchasing!